The Relationship Map is an artwork which charts how different people make connections and relationships between fundamental concepts – like Mum/Dad, Me/You and Heart/Mind. It is inspired by the map and tube lines of the London Underground. The map features submissions from 50 contributors who charted how they felt about each of the concepts. 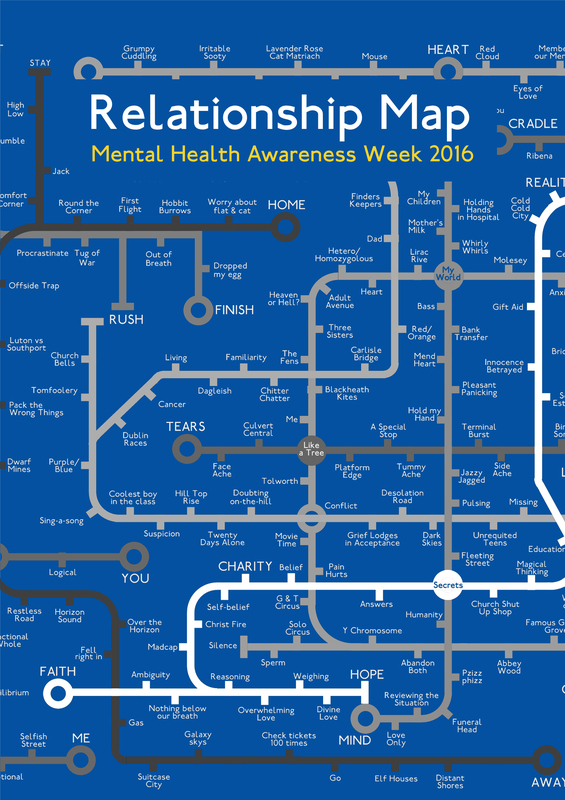 On the 20th May 2016 a large scale Relationship Map was exhibited in the Rickett Quadrangle at Middlesex University, Hendon, UK as part of the MDX Let’s Talk event for Mental Health Awareness Week. MDX Let’s Talk is a Middlesex University initiative which aims to raise awareness of mental health/illness through collaborative working of University staff, students, public and local/national agencies. Through this we hope to raise awareness of mental health and signpost to any relevant services for support if needed. Contributors include Tamara Jelača, Iain Inglis, Peter Turton, Peter S Smith, Liz Dolan, Harvey Wells, Dean Reddick, Jerome, PD, Natalie Low, Jill Hedges, Effie Aye-Maung-Hider, Alban Low, Steve Cohen, Ruth Dalton, Kevin Acott, Katie Stone, NAA, David, Colin, Seamus, Amin, Bryan Benge, Sarah Dewing, Tom, Pam, Mehmet, Arnand, Imran, Wayne Sleeth, Tanya Kreisky, Stuart Crewes, AS, Eddie, Julie Reay, Tracy Ferriss, Helen Reddick, Sammy, Dawn Duncan, Melanie Woodcock, Peter T, Robert Good, Jo Lansdown and 7 anonymous submissions. 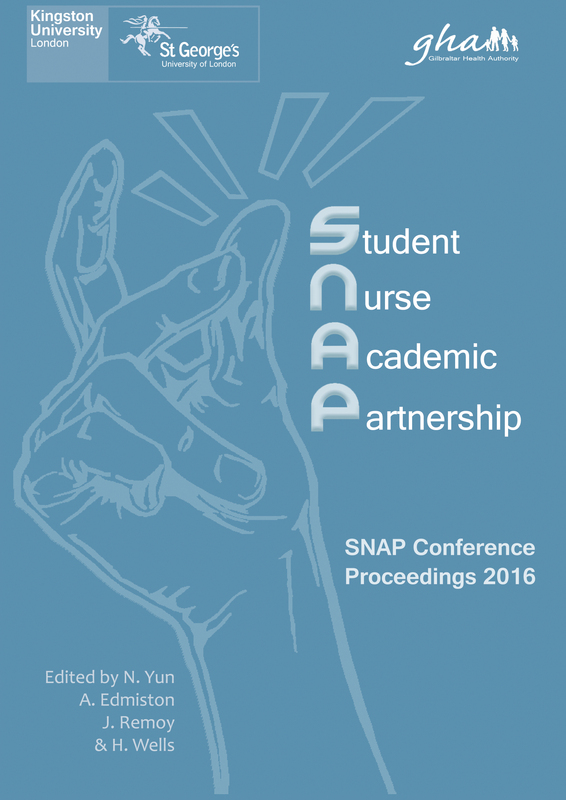 The Student Nurse Academic Partnership (SNAP) Conference is an educational initiative developed between the Schools of Nursing at Kingston & St George’s and Gibraltar Health Authority. SNAP aims to give nursing students the opportunity to share their ideas and experiences of nursing with other students, academic staff and practice partners. Nursing students partnered up with an academic of their choice to submit an abstract of their ideas relating to nursing theory, education or practice. The best abstracts were selected to be presented during the first SNAP conference on 13th January 2016 at St George’s, University of London. Following the successful delivery of the presentations, the student nurses have written up their presentations into papers that are published here as conference proceedings. This journal opens with a foreword by Dr. Julia Gale and contains the featured paper by Professor Ian Peate, ‘The Trouble with Men…’. The other eleven articles were written by student nurses and demonstrate the passion and enthusiasm student nurses hard for their chosen profession. The papers are authored by: Emily Davis & Angela Richardson, Aurelia Edmiston, Rhianna McGowan, Gemma Pumford, Elizabeth Ross & Dr Jayne Price, Pardina Samson-Fessale & Mary Brady, Katrina Sealey, Ekta Shah & Robert Stanley, Daniel Sinclair, Daniel Waters & Denise Bodley, and Nikki Yun & Paul Newcombe. Nursing is an art, said Florence Nightingale – and today it is also a science. Nightingale’s birthday on May 12 is celebrated annually as International Nurses Day. To mark the occasion this year, Kingston University and St George’s, University of London, are proud to present the winning entries in our poetry festival. 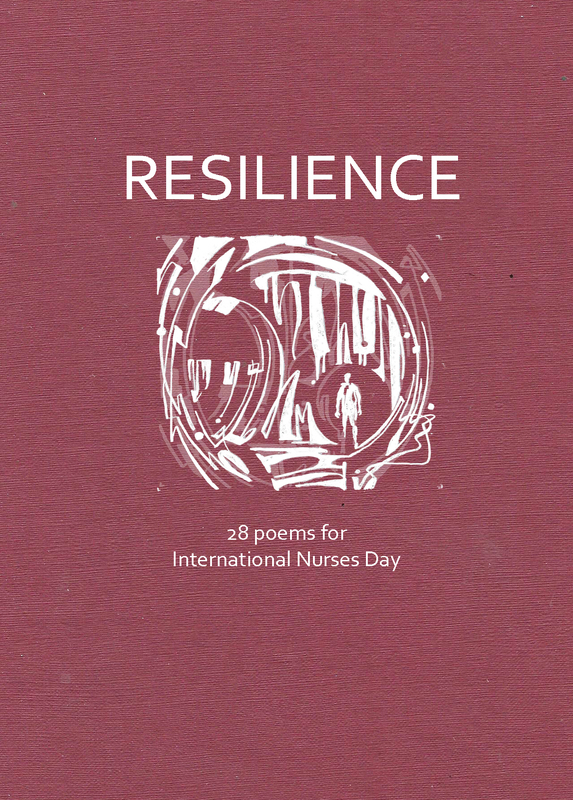 The entrants, mostly nursing students, rose magnificently to the task of writing a haiku, or short poem, inspired by the word ‘resilience’. This was chosen to reflect the theme of International Nurses Day 2016, chosen by the International Council of Nurses – Nurses: A Force for Change: improving health systems’ resilience. reflect the joy, pain, humour and complexity of caring, in ways that celebrate all that is great in the art and the science of nursing.